A simple 4 ingredient, incredibly thick green smoothie filled with healthy produce and leaving you energized. And it actually tastes good. Tropikale… tropical + kale. See what I did there? SALTS. The start of a new year. New beginnings, clean slate, fresh starts. 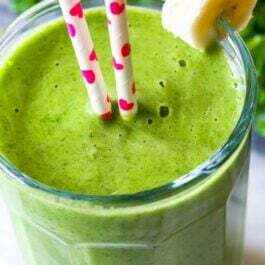 Let’s kick it up a notch and energize ourselves with a gorgeous, totally energizing, and actually-tastes-good green smoothie. There is nothing fancy about this smoothie. No strange ingredients you can’t pronounce. No chalky protein powders, no added sweeteners, no nut butters, no dairy. Just produce you know, love, and is readily available to you. Eating (and drinking!) healthy doesn’t have to be a chore. I guarantee you’ll fall in love with this simple, tropical infused green smoothie and if you’re anything like me, begin craving it every day. There are only 4 ingredients you’ll need: kale + pineapple + frozen banana + almond milk. I call this my “magic formula” and the perfect, tropical tasting starting point for other flavors. Add some strawberries for a berry-tropical blend or add some frozen mango chunks to turn the tropical flavors up. For a citrus infusion, add an orange and a splash of orange juice. The possibilities are endless here; make a different smoothie each week using this smoothie as a jumping off point. Hello, healthy you. Since there are so few ingredients, there is little playing room with substitutions to the basic formula. The frozen banana is key and if you’ve reading my blog for awhile, you know why. Ultra creamy, ultra thick texture. Freezing the banana rids some of the banana flavor as well. 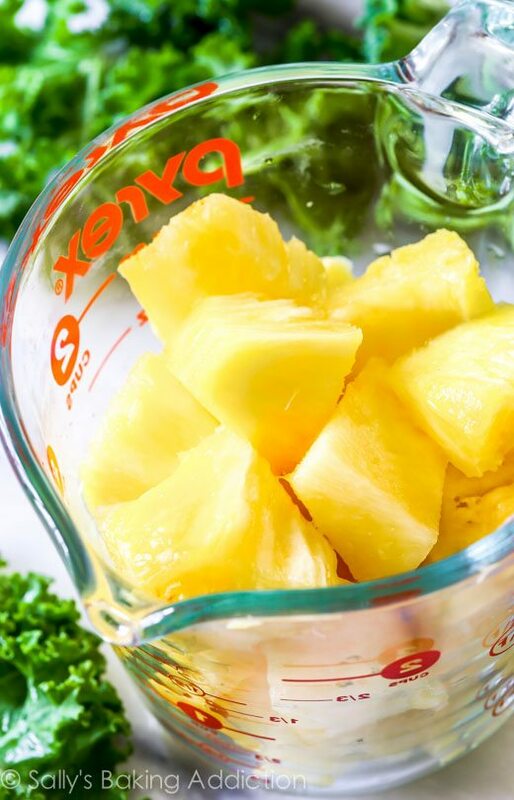 The pineapple is where all the flavor lies, so I don’t recommend using a different fruit. Coconut, soy, or cow’s milk are fine replacements for the almond milk. And kale could easily be replaced with spinach, but then you won’t be able to say tropikale anymore. Which I’m sure you care about… right?? I like to make two of these smoothies at a time in the morning. Drink 1/2 in the mid-morning for a burst of energy, put the remaining half in a cup with a lid, keep it in the refrigerator and enjoy in the afternoon. Or just keep the other half in the blender in the refrigerator to have later in the day. ↑ Oops that picture is definitely blurry. Here’s to a healthy January with some weekend cake on the side. You just drank kale! You totally deserve a slice of cake. 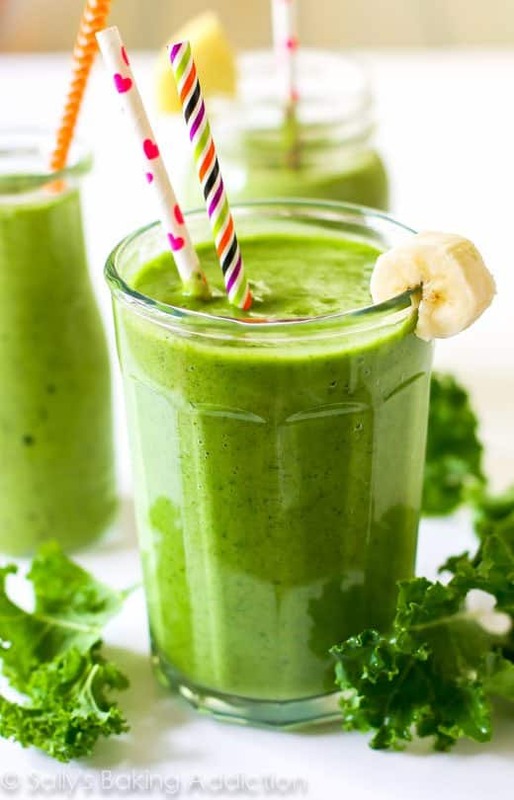 Make sure you have a strong, powerful blender that will blend up the kale and frozen bananas. I like this Ninja or this Vitamix. Add all of the ingredients to the blender in the order listed. Blend on high for at least 3 minutes or until smooth. Scrape down the sides of the blender as needed. Add more milk if it's too thick. Serve and enjoy. Store any leftover smoothie covered in the refrigerator for up to 8-10 hours. Makes 2 smoothies. 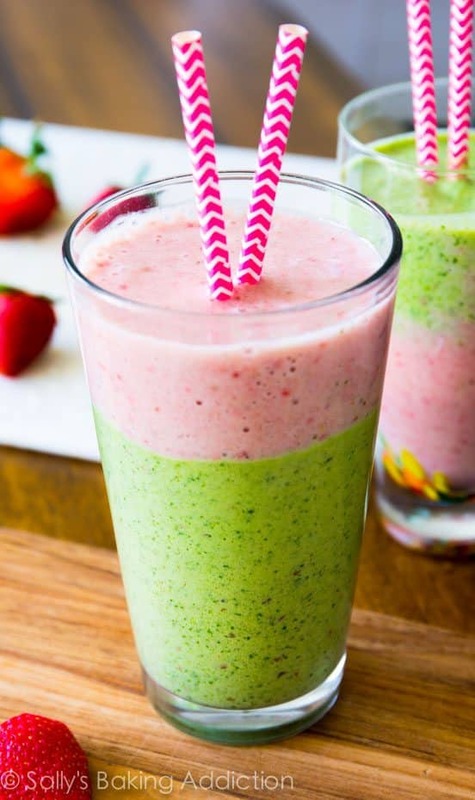 You can easily halve this recipe to make only 1 smoothie. I like to make two at a time and keep half in the refrigerator to enjoy later in the day. I call this smoothie my "magic formula" and the perfect, tropical tasting starting point for other flavors. My suggestions for variations: add some fresh or frozen strawberries for a berry-tropical blend, add some frozen or fresh mango chunks to turn the tropical flavor up, and for a citrus infusion blend in a peeled, sliced orange and a splash of orange juice. Coconut, soy, rice, or coy's milk are OK instead of almond milk. I always use unsweetened vanilla flavored almond milk. See more slim-down smoothie recipes.